1. Make sure that your phone is paired and connected to HFL. 2. Select the Bluetooth® Audio mode. If the phone is not recognized, another HFLcompatible phone, which is not compatible for Bluetooth® Audio, may already be connected. 2. Rotate to select Play or Pause, then press . 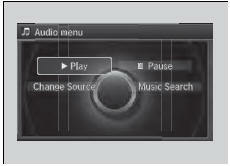 Select the play icon or pause icon.